What is the Alexpotato Exchange? So what exactly is a contract? What does the price of a contract mean? So how do I buy a contract? When should I buy a contract? How do I sell a contract? When should I sell a contract? Why is the price I paid different than the price listed? What is a bid order? What is an ask order? So how do I start short selling? How are new markets opened? How good is the Alexpotato Paintball Exchange at predicting the outcome of events? 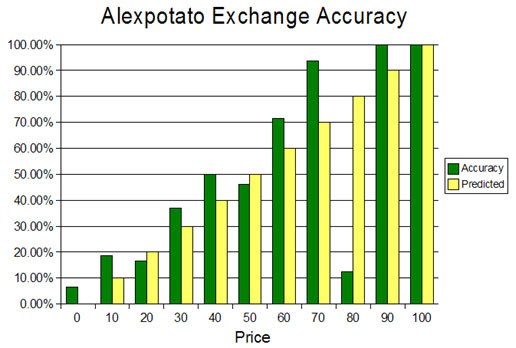 The Alexpotato Exchange is a futures contract market for probabilistic predictions of upcoming events in the paintball industry. In English, it's basically like a "stock" market for predicting what's going to happen in the future of the paintball world. Also, all the money is fake money. No actual financial transactions take place. An event in the future, e.g. Team X wins Event Y, has a contract. If that event happens and you own those contracts you get 100 AP(AlexPotatoes) per contract. Now, each contract has a price that can changed based on what people think it's worth. That price is like a value on the "odds" that event will happen. For example, if the price is 5 then the market thinks there is a 5% chance of that happening, 50 = 50%, 90 = 90% etc. Each contract is linked to an event that will happen in the future. If that event happens, either it does or it doesn't, and you own those contracts you get 100 AP per contract. If it doesn't happen, you lose your initial investment in those contracts. Think of a contract as a "bet" that something is going to happen. For argument's sake, we'll use the example that Team A makes it to the final 4 at Event Z and you own 5 contracts that you bought at 50 AP each. If Team A makes it to the final four, then you get 500 AP (5 contracts X 100 AP). You initially spent 250 AP (5 contracts X 50 AP) so your profit is 250 AP. If Team A does not make it to the final four, then you get 0. You initially spent 250 AP (5 contracts X 50 AP) so your loss is 250 AP. The price is basically the probability that the event will happen. So, a price of 50 would equal a probability of 50% whereas a price of 75 would equal a probability of 75%. A price of 100 would mean that the event is 100% going to occur. Since the price is like a probability, the maximum price a contract can have is 100 and the minimum is 0. Now, the price is not fixed or decided by one person. The price is what all of the traders have decided is the best price for that contract. This will be explained in more detail later. There are currently five levels of traders. To make it easier for new traders, everyone starts at Level 1. Here is a rundown of each level and how much it costs to get to the next level. The simplest way to buy a contract is to do a "Market Buy". This means that you buy the contract at the current market price. When buying, whatever the "Ask" price is for the contract is what you will pay per contract. First of all, look at all of the available contracts here. If you see a contract that has a price(the Price column) that you think is too low, you might want to buy it. This means that the last price paid for this contract was 45 which means that the market thinks there is a 45% of this happening. If you believe that that odds are higher, say 60%, you should probably buy this contract. If you would like to sell a contract, the easiest way is to do a "Market Sell". This will try to sell the number of contracts you have at the highest available "Bid" price. NOTE: As a Level 1 or 2 trader, you can only sell contracts you own and you can not sell more than you currently have. Putting in an order that violates these constraints will cancel that order. If you see a contract that you own that has a price(the Price column) that you think is too high, you might want to sell that contract. This means that the last price paid for this contract was 75 which means that the market thinks there is a 75% chance of this happening. If you believe that the odds are lower, say 65%, you should probably sell this contract. NOTE: This decision is also based on how much you paid for the contract originally. For example, if you paid 20 per contract this is a very good time to sell. However, if you paid 60, you may want to review your decision. Every contract has three price related fields: Price, Bid and Ask. The price listed is the "last" price or, in other words, the price of the most recent completed order. The bid is essentially "what sellers will receive" for a contract. The ask is essentially "what buyers will pay" for a contract. When you do a market buy, you pay whatever the ask price is. On the flip side, when you do a market sell, you get cash equal to the bid price. Only traders at Level 2 and above can see bid/ask prices. Placing a bid order means you are saying the following: I am willing to buy contract A at any price up to Z. This means that the last price paid for this contract was 75 which means that the market thinks there is a 75% chance of this happening. In your opinion, this is too high because you think that at Team F only has a 55% chance of winning. Now, if at any point in time after you enter your bid order if someone either a) does a "Market Sell" of W_TFEZ06 or b) does an "Ask" order for W_TFEZ06 at a price below what you entered, the system will attempt to fill your order. NOTE: If you do not have the cash to cover the order at the time it matches another order, your order will be canceled. NOTE2: The price used in any transaction is the price specified in the older order. For example, if your order is placed first that price will be used. However, if your order matches up with a pre-existing "Market Sell" or "Ask" order then the older price will be used. Placing an ask order means you are saying the following: I am willing to sell contract A at any price above Z. This means that the last price paid for this contract was 50. Let's assume you own 100 contracts of W_TFEZ06. You purchased these contracts at 40 and you think they will go up to 70. However, you are willing to sell them if they go above 65. Now, if at any point in time after you enter your ask order if someone either a) does a "Market Buy" of W_TFEZ06 or b) does a "Bid" order for W_TFEZ06 at a price above what you entered and your price is the lowest ask order price, the system will attempt to fill your order. NOTE: If you do not have the contracts to cover the order at the time it matches another order, your order will be canceled. Short selling, or shorting, is when you sell contracts that you don't own. Why do this? The primary goal of short selling is to gain from the decline in the price of a contract. For example, let's say there is a contract named XYZ. It is currently at a price you think is too high, say 90 AP. If you don't own any XYZ contracts you can't sell it and therefore can't really do anything to lower the price. However, you can borrow contracts from the exchange and sell them. If XYZ doesn't happen you pocket the difference. If XYZ does happen, you owe the exchange. The easiest way to show this is with an example. You think that 75 is too high a price for this contract. However, you don't own any XY06. So, you need to short sell. Currently, in order to short sell you need to have 100 AP in "margin" for every contract that you short sell. So for example, if you want to short 100 contracts you need to have 10,000 AP in your margin account (100 contracts * 100 AP = 10,000 AP). Next, you would do a short sell of XY06. Since the current Ask is 72 you would receive 72 AP for each contract you short sell. Scenario 1: Contract result happens and contract pays out. You get to keep the 72 but you lose the 100 you set aside in the margin account for that contract. Scenario 2: Contract expires and result does not happen. You get to keep the 72 AND the 100 you set aside in the margin account for that contract. The easiest way to think about margins is that margin is like collateral. When you short sell, you are "borrowing" contracts from the exchange. Your margin amount is your guarantee to the market that you can cover your short selling. Due to the reason mentioned above, you can always add money to your margin account. However, you can only take money out as long as you have 100 AP in the margin account for every shorted contract. If you close out a short position then you can take money out of your margin account. You can now take the 200 AP out of your margin account. First of all, you need to be a Level 3 trader in order to short sell. To update your level, login and go to your User Panel. You can find a link in the navbar on your portfolio page. Once you upgrade to Level 3, there will be a margin table where you can set how much cash you want to cover your shorts. You need 100 AP for every contract that you are going to short. Once you have put aside some credits in your margin account, you can just go to your portfolio and start short selling. Short positions will show up as a negative( e.g. -4) in the list of contracts that you own. To put in a short order, you just do a market sell. The exchange will pickup that you are a Level 3 trader and perform the short for you. If your short order is reviewed and you don't have enough margin set aside then your order will be cancelled. If you own a certain number of contracts and you put in a sell order for more than you own, the exchange will check to see if you can cover the excess from your margin. e.g. You own 20 shares of XY06 but and you Sell 30. If you have 3,000 AP in your margin, you will now have a -10 short position. If your margin is less than 3,000 AP, your entire order will be canceled. From the buyers point of view, there is no difference between buying contracts from a Sell or Short Sell. First of all, all new market openings are announced via email to all traders. Keep in mind, open markets are not necessarily open for trading. This is explained below. Once all traders have been notified the market is opened, bids need to be entered for the most "popular" contracts. Why do this? Well, in order to decide the opening price for a contract in a newly opened market, each trader should submit a bid price for any contract they are interested in purchasing. When the market begins trading, the trader with the highest bid price will "win" the bidding process and get the contracts. Some people have asked why they shouldn't just to do a market buy in this case. This is certainly an acceptable course of action however you are at the mercy of whoever wins the bidding process. For example, you think contract X at 50 is a good price. If you just do a market buy, you may end up purchasing contract X at a price higher than 50. Whereas if you had submitted a bid, you would know that you would be purchasing the contract at no more than 50. From a market point of view, having multiple bids from multiple traders before trading begins so that the opening price is a fair representation of what the traders think the contract is worth. Since the Alexpotato Paintball Exchange is a prediction market this is a very good question. We can answer this in two ways. The first is to see how well prices reflect the actual odds of the contract paying off. So what does this mean? Well, in the chart above, the yellow or "Predicted" bars show how often we would expect contracts at a certain price to happen. For example, a price of 10 means pay outs should happen 10% of the time, 50 should pay out at 50% etc. Now, the green or "Accuracy" is how often the contracts at a given price actually paid out. From the chart, we can see that there is some variation. For example, for contracts below a price of 50, the predicted and actual payout odds are pretty close. However, the higher we go, the larger the difference. We can see that contracts with a price of 60 pay out almost 90% of the time whereas contracts at prices of 80 and 90 pay out 20% and 50% of the time respectively. The overall result of this is that for low probability contracts, the market is pretty accurate. However, it seems that contracts in the 55-65 range are generally undervalued whereas contracts in the 65-95 range seem to be generally overvalued. For this discussion, we ranked the contracts by price for winner, top 4 and bottom 4. We used the highest price winner contract and the 4 highest top four and 4 highest bottom four prices as the "predictions" for each event. Given the above criteria and only using PSP events, the market predicted the winner at one of the events. However, it did pick 14 of the 24 top four and 11 of the 24 bottom four teams. For comparison, if you were to randomly pick teams, the odds of randomly correctly picking 14 out of 24 top four finishers from 6 events is 0.045% or 4.5 in 10,000. For 11 out of 24 teams it's 1.398% or just about 1 in 100. In summary, the Alexpotato Paintball Exchange is a) MUCH better than random and b) seems to be pretty good at determining the odds of how teams will do at paintball events.